Chest to Girth Support Strap is a support strap that can be added to our vests or harnesses. It is easy to put on and take off with the hook & loop type closure. The front part of the Chest to Girth Support Strap covers the dog's breast bone and has safety reflective materials on the front of it. This support strap works especially well with vest that have packs on them because it keep the vest and packs in the upright position. 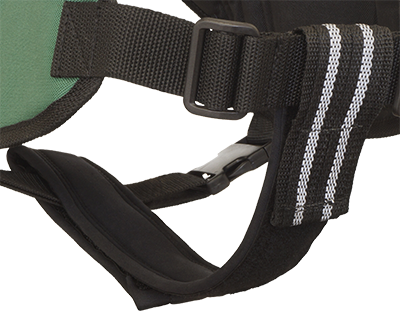 This Chest to Girth Support Strap goes down the chest through the front legs under the belly of the dog and attaches around the girth strap of your vest or harness. This support strap will help support the dog's underbelly making the vest/harness a more secure harness for pulling or carrying packs while the dog is working. This Chest to Girth Support Strap also works well for those dogs that want to roll and rub off their vest/harness. You can choose this Chest to Girth Support Strap made from Neoprene or Sherpa.